Bootie LA – Comic-Con Pre-Party! Los Angeles Bootie LA – Comic-Con Pre-Party! Bootie helps you get ready to spring into action for Comic-Con, with a Midnight Cosplay Costume Contest with ca$h prize$! ShyBoy and Rawburt spin geeky mashups all night! Only $5 before 10 PM! 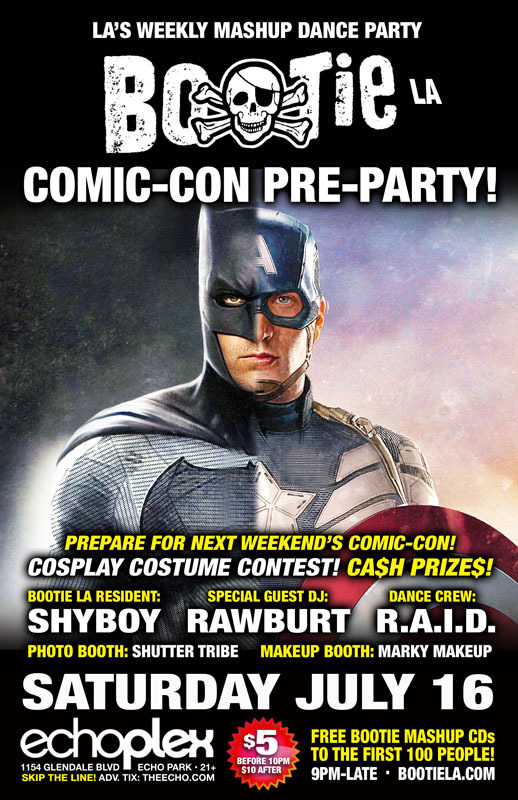 Prepare for next weekend’s Comic-Con and cosplay at the club! COSPLAY COSTUME CONTEST at midnight! Ca$h prize$! Comic-Con is coming up, and Bootie is here to help you spring into cosplay action as you gear up for the big event! If you really want to pull out all the stops, enter our Midnight Cosplay Contest for a chance to win ca$h prize$! Bootie LA resident DJ ShyBoy will be joined by Rawburt, as throw in some geektastic Comic-Con inspired mashups into the mix. Plus, resident dance crew R.A.I.D. (Random Acts of Irreverent Dance) will fill the stage with villainously good go-go heroics, Marky Makeup hides your secret identity, and Shutter Tribe captures it all!